Film Documentary Project for Waggy! One of our Club members, Katie Sullivan, is working on a Film documentary on Saving the Jeep Grand Wagoneer. She is looking for sponsors /producers for the Independent film. So if any one knows any one to network with or sponsor please let Katie know. It would be awesome to be at "SUNDANCE"
Katie also won 2nd place at the "Batham Jeep Festival" at Buter, PA. Home of the founder of the jeep. Right now I'm working on securing funding for the project. I have 5 years of experience working with Public Television, so that's an avenue I'll definitely try to pursue. You're welcome to post the link to the documentary concept website. Maybe you could announce that it's in the works, that it needs support, and suggest that folks check it out to learn more about it? Generating a buzz about it will help it gain momentum. You're awesome! And your incredibly kind post made my day! I'll keep you posted on it's progress. A very BIG Thank you to all Club Members for making Saving Jeep Grand Wagoneer's Club a great website and Club. We have become International. We have Wagoneer lovers all over the World. That is just amazing! On this week, we want to give thanks and prayers to all the people effected by SuperStorm Sandy and we do want to have PEACE and LOVE in our lives. 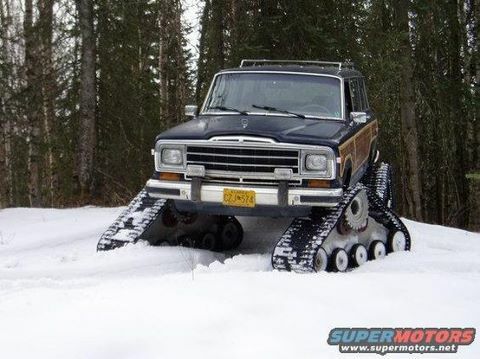 Keep Saving those Jeep Grand Wagoneers. Head out for a ride and be Happy and Enjoy! Give IT UP for our Gals! YA!YA! LEt's Give it up for our Gals at Sema who won. Getting ready for the Turkey Run weekend. Oh, Look what got saved. I emailed the group to send us a "Heads-up" for next years run. So all you Mudders out there keep us posted on some weekend events. we are happy to pass the word around. Yep ....we still got it! Here is our Saving Jeep grand Wagoneer's Club Pintestest Pin. I hope it works...pretty neet social media site. Attention Club members in PA-Ohio-West Virginia-Maryland areas. If you need your wagoneers towed John has offered his services. He charges by the milage($1.75/p/mile) plus the project. It's nice to know we have people out there that can help us move our wagoneers when we can't! Contact: John Roboski @ 724-454-8893. I was flipping channels on the TV and came across these guys from Texas doing rebuilds and Rat-Rods! Finally something to watch on TV. 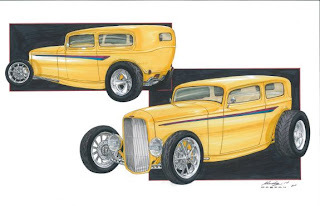 They have the same passion to "Keeping Old Cars, Trucks, Rat Rods on the Road". Thinking Outside the JEEP Box! Let's see if this jeep can fly! Meet The Tail Boss by Wagonmaster. I want one of these! YA!YA! Lots of pictures on the FB page..check them out! Club Member Takes 3rd place Trophy! Club member, Katie Sullivan takes 3rd place trophy at the Bantam Jeep Hertiage Festival in Butler, PA! Check out her pic in the time line at FB. She was up against some classic jeeps and her Wagoneer wins the trophy! Put this on your Bucket List for 2013! Jeeps every where you turned. Put this event on your Bucket list! YA!YA! I have neck sprain. 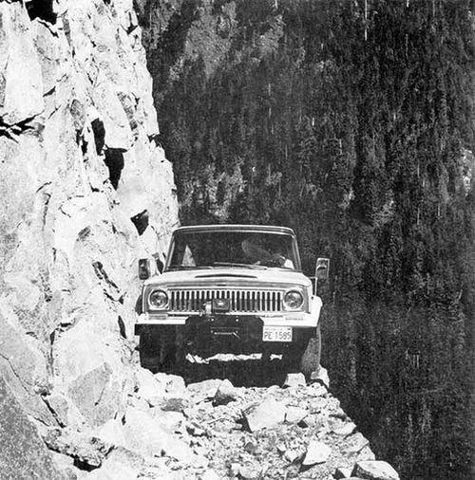 Everywhere you turned was a jeep. People from all over the world attended The Jeep Hertiage Festival in Butler, PA. I am going to take the whole weekend next year. There was so much Jeep to take it all in you would need a few days. The City of Butler out did themselves. Just got this notice today...hope it's not to late. we are heading there on Sunday. 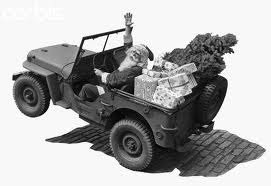 The Father of the Jeep. Rare Jeep Wagoneer for sale! Club members, we have to Save this Rare Wagoneer. This is a very RARE 1982 Jeep Cherokee Chief. 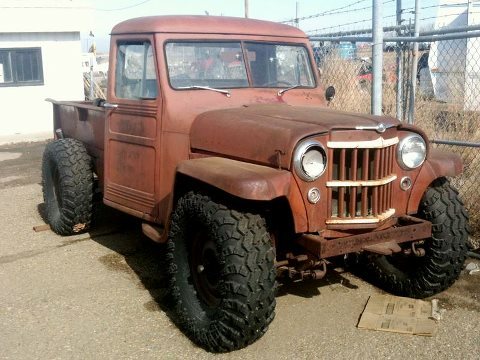 This is the fore - runner to the Jeep Grand Wagoneers. Interceptor intake from HD 7227. Clean Title and Inspection till next year. Contact: Bruce Wissinger @ 1-814-418-3128. NOTE: I spoke with Bruce yesterday. He has no internet. Phone is old ans machine no caller ID. I would buy this one myself in a Heart Beat! 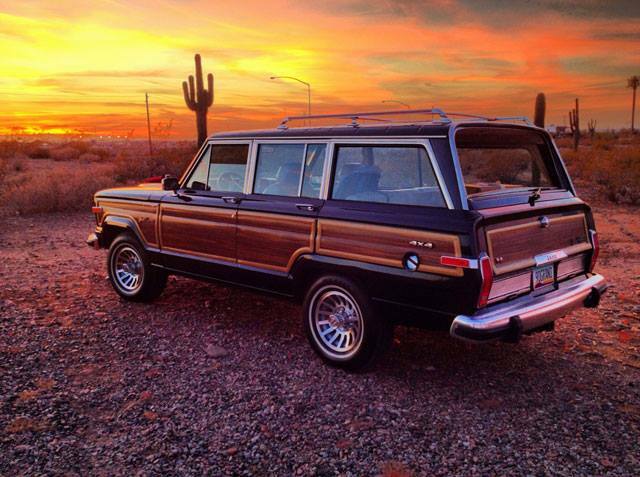 LEt us know if you SAVED THIS RARE WAGONEER! Note: IT's Blue in Color! OPEN TO THE PUBLIC - $10.00 Admission Fee. Page 21 of the catolgue has a 1948 Chevy Woody available...only now engine....just frame from cab back. Still in good shape. There are a lot of Beautiful cars and trucks....even if you don't buy it's nice to meet and greet and make new car buffs. WE Save These Jeep Trucks, too! Saving Jeep Grand Wagoneer's Club is looking for Business Investment Partnerships. We are ready to step up to the next level. Saving Jeep Grand Wagoneers is putting their feelers out for Investment Partners for a Restoration Wagoneer Garage in State of Pennsylvania. 1. 3 properties up for sale. 2. 2 properties have commerical zones. 1 is private property . 4. 2nd property is commercial through a real state agent. This one has limited acres. 5. The private property has house, two car garage, and 8 acres. It needs remolding big time. ***WE are open to International offers,too. Back From 4th of July Holiday! We hope everyone enjoyed their 4th of July vacation. We sure did. 1. AutoZone is giving a way free gas. check out their website. 2. Found Flaming River.com for Steering Column kits(these are hard to fine). 3. Dustless Blasting.com has a nice handyperson's garage sandblaster equiptment deal. 4.National Parts Depot.com has lots of Truck parts available. This weekend we are tackling the garage...taking everything out....cleaning it. If any Club members has anything else they want to share with our Club please let us know. We will be more than Happy to post the information for you. 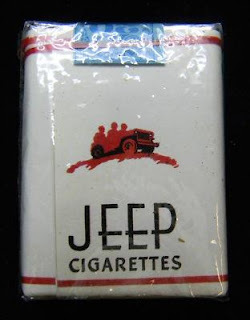 Ok, I got all the information on try to get the cost down on the Jeep Grand Wagoneer's Club Zippo ligher...They are not set up to do individual orders of one product over the internet. So the only way I can get you one is you send me the money and I customize the zipper and send it back to you. It is a Bummer to do it this way. However, I will take the time to do it if anyone wants a lighter. NOTE: I got my lighter yesterday ! It was really worth it!. Looks really cool. As soon as I get my camera fixed I will get a picture on the site for you. I am very satisfied and Happy that Zippo can customize a Club lighter for us. Club Member visits Wagoneer Graveyard on Vacation! Are Club members are Awesome! We are a breed of our own as the saying goes. Club member Katie Sullivan actually went to visit George from Montana Overland(Wagoneer Graveyard for parts)! Now, only a Wagoneer lover would put that on sites to visit while on vacation. "Thanks to your mention of Montana Overland, I built in some time to visit during my recent cross-country move. George and his son Chad couldn't have been nicer! Thanks so much for the incredible tip! I'll always remember my time in Big Sky Country!Montana Overland" KS. Remember: George and sons will give us a discount when you mention our Saving Jeep Grand Wagoneer's Club. Although it's not a Jeep Grand Wagoneer...it's still a safety issue that you should all be aware of. Pass this one on to your fellow Jeepers. We are back in Commercials again! I just entered Chrysler Commercial promo to win a new van to promote Saving Jeep Grand Wagoneers. YA!YA! Note: It says you have to vote for your choice of worthy causes. So Let's give one vote to our club! Last night Jeep Grand Wagoneers was driven to the max in the new "Hopper" commerical. Keep Saving those Jeep Grand Wagoneers, Partners! Never leave home without this tool! Hey Club members in California, Neveda, Arizona and surrounding areas. Big Car Show on June 2, 2012. I just placed a customized order for "Saving Jeep Grand Wagoneers" with Zippo Lighter Company. I put the name of the Club and a pic of a Wagoneer. I am excited to see how it turns out. Out of Pocket price is around $50.00 for custom. I just fired off an email to company to see if You can order it directly from their website. Note: this is a sample of the one I customized for the Wagoneer's Club only with a picture of the Jeep Grand Wagoneer and the name in white letters. Looking Sharp! Who wants a road ready, fully functional, museum restored M38A1 complete with a 30.Cal machine gun? Were still working with the state of Florida to be able to sell tickets online, so watch this space!!! The actual raffle will take place in October and you wont have to be present to win.I can be reached at JimK@uveterans.org. or 1-813-421-2210. I hope a Saving Jeep Grand Wagoneer Club member wins this one! YA!YA! Inking for Wounded Warrior Fund Raiser. There will be an "Inking" fundraiser for Wounded Warrior Foundation. Held at "The Patriot Tattoo Shop"
May Events for Cars and Bike. Two great events to attend. Both located in Southern California area. San Diego, CA. Check your local listing for other events in your neck of the woods. Rat Rodder's 39th Annual Show at Campland's. Wounded Warriors Foundation Fundraising Events. ps: I am a member of both clubs! Good News from Jeep GraveYard! George,owner of MontanaOverland.com(Jeep Graveyard) is very Happy to give all Saving Jeep Grand Wagoneer's Club members a DISCOUNT! Just make sure you tell him you are with our Club. Montana's Jeep Grand Wagoneer Graveyard! One of our FB Club members turned us on to this business. He has a grave yard of all Jeeps. Man, I have to put this show on my schedule for this October! Here is the show's website: 2012 SEMA Show Las Vegas Oct 30th. 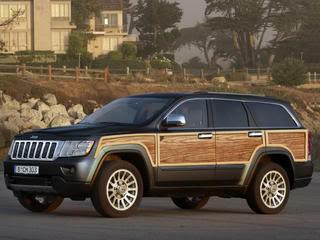 Woodie Auto Trim Kit For Wagoneers! Hey Club members, a Wagoneer Club member from Texas sent us this link if your are refurbishing your Wood paneling on the Wagoneer. Check this panel kit out. You have to email for pricing. It is a great find and very helpful to our restore projects. YA!YA! If anyone of our lucky club members win the big mega ticket tonight, please remember our Saving Jeep Grand Wagoneers Club mission...."To Save All Jeep Grand Wagoneers from the scrapyards". YA!YA! MAY LADY LUCK SHINE UPON YOU! The Jeep Grand Wagoneer was voted #10 of the "Most Quintessentially American Cars". We made it! Number 10 on the list. That is why we try Saving Jeep Grand Wagoneers from all the scrapeyards. We have the Love and Passion for these beautiful vehicles. WoW! just saw this one on re-runs. Stacey Davis is my kind of guy. Really like his shows on "How tos!" Done the easy way and most affordable for us Garage guys/Gals. Finally someone telling you the truth! and Jeep (J-10/20 ) from the Scrapyards. So keep "Saving those Jeep Grand Wagoneers"! YA!YA! PS: Very good Upgrades for improvements to your truck's/cars performance on a low budget. It's at the end of the show. Watched the "Pimp my ride" Show the other night and saw them pimp out a Jeep Grand Wagoneer. Ok, the guy could have fixed the inside himself...(he said he was a handyman...Really?). I got a couple of good ideas for future rebuilds for myself. air lifts etc. I was not impressed with the paint scheme nor the upholstery. However the Wagoneer did get tricked out. We are setting up a Google Cloud account. So for you members that still want to keep in touch with us via the "Cloud"
You can do so without missing out on all of our updates. asap. You can still get us by searching for Saving Jeep Grand Wagoneers. Let me know about any helpful suggestions. Note: here is the first link....try it to get to the cloud. Saving Jeep Grand Wagoneers in the Cloud. check out AutoZone for a chance to win $25,000. Grand in tools and parts. We believe in "Paying It Forward" in our lives. We have choosen this year as our donations two great causes. 1. St. Judes Children's Hospital. A Homeless Shelter for our Women Veterens who are serving our great country. Welcome 2012 and New Members! Welcome 2012 and all new members + all our old faithfulls. Happy New Year! Things are moving along with our garage. Starting to do little projects and updates. So Keep Saving Those Jeep Grand Wagoneers! Don't forget to FaceBook and load up your updates on your projects and anything Wagoneers. Remember our Co-Partners....Free-Jeep-Classifieds.com for Buying and Selling Wagoneers. Best to all Club members.